It's Monday night, and I have just ended a crazy six-day 'squatch-a-thon that has temporarily exhausted me. (Tomorrow might be day seven, but so far I have no plans that will take me out to the woods. Still, with my crazy life, I never know.) So much has happened over the last week that it's hard to remember it all, but I'd like to recount some of it for you. Since the best place to start is the beginning, here goes. As of last Tuesday, I have officially checked out of my classroom for the summer. I hit the ground running on Wednesday when a friend and took a day trip to Silver Star Mountain. The purpose of my visit was to obtain some crucial measurements at the location of the Silver Star photographs that would help me determine the size of the subject in the pictures. 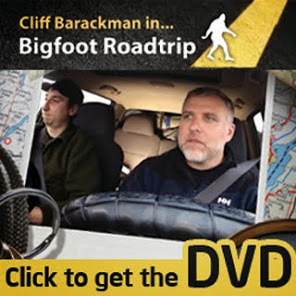 which possibly show a bigfoot. I was a little concerned about this trip because I had something riding on it. If things went well on Silver Star, I could use the data to piece together an interesting presentation for the impending Oregon Sasquatch Symposium where I was scheduled to speak on Saturday. I had a back-up plan for the gig's speech, but I really wanted to do the Silver Star presentation. The weather was a bit dreary with a light rain that incessantly kept me soaked. Though it was beautiful, it was a bit unpleasant at times. Having forgotten my gloves, I was bummed (though slightly awed) at how my hands weren't able to function normally, losing most of my usually good fine motor control. I described my hands to my friend as "numb," but they actually tingled painfully. 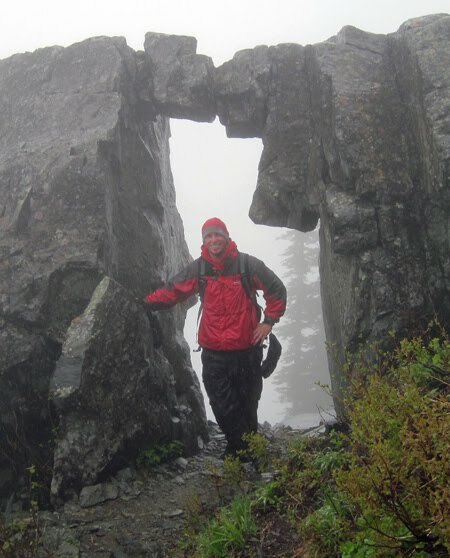 My hiking friend, known as "The Weave,"
under a natural rock formation on Silver Star Mountain. When we finally arrived at the mountain's summit, which is the site where the photographs were taken, my fears were realized. The visibility was so poor that the necessary measurements could not be visually obtained. You see, Silver Star Mountain has more than one peak. 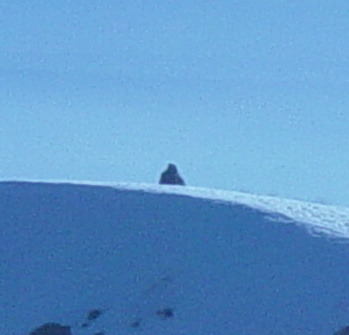 The possible sasquatch in the photos was standing on an adjacent peak from the photographer. Even though the distance was less than 200 meters, last Wednesday I couldn't see the other summit from where the photographer took the pictures. Having obtained decent enough measurements to do a rough size calculation, I set aside the entirety of Thursday to do the math and to make a slide show presentation for the OSS gig. With the constant stream of interruptions that is my life, I finished these tasks late in the evening and went to bed. I needed rest. The next day would be the kick off of the Oregon Sasquatch Symposium, the start of what was sure to be an exciting weekend. In the next blog, I'll give accounts of my short weekend in Eugene, OR at the OSS. After that, it will get even more 'squatchy.